A silver Kidduah cup and saucer set is the perfect wedding gift for a couple beginning a new life together, a life that will hopefully include many festive Shabbat and holiday meals. 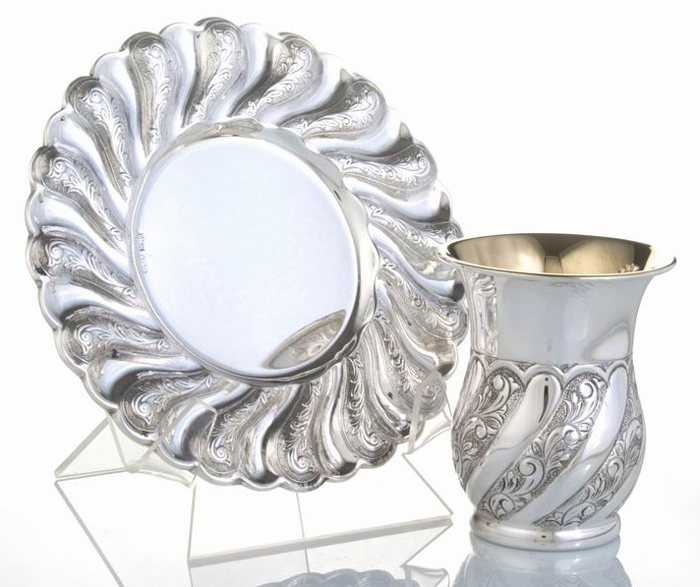 This gift set from Israeli Judaica designers Hadad Silversmiths includes a sterling silver Kiddush cup and a matching silver saucer. The fine materials and top-quality craftsmanship in this silver cup set ensures that this wedding present will become an instant heirloom and be passed down for generations. Hadad's Kiddush cup features the Toscana floral design that swirls in panels down the curved side of the kiddush cup. The rounded-edge saucer is embellished with alternating raised swirls. The spaces between the raised elements is filled with the same Toscana pattern. The cup holds the Shiur (halachic amount) of wine required for Kiddush. As only Jewish artisans created this item, there is no need to Tovel it (immerse it in a mikvah).